I attend my fair share of food and wine festivals. The 18th annual Epcot International Food and Wine Festival is my third in September alone, and it’s like nothing I’ve ever seen before. The food and the flavors, paired with a tablespoon of Tinkerbell’s magic touch, mirror Walt Disney World’s scale and imagination. True to Walt’s legacy, when Disney does something, they don’t just do it well, they go beyond. Rather than take a weekend or a four-day stretch – like most food festivals in North America – to showcase their global focus and menu, Walt & Co. make it a 46-day extravaganza with all the fixings in Orlando, Florida. To get a sense of what it’s like, imagine Disney’s classic “it’s a small world” ride. Now picture yourself on it, and around every transcontinental corner, a pop-up restaurant awaits. Breakfast in France, lunch in Mexico, and dinner in Japan – at Epcot, it is a small world after all! Audrey Hepburn once said, “Paris is always a good idea,” and I could not agree more. Every morning my sous chef (aka, my husband) and I started our culinary culture crawl at the foot of the Seine. Forget cafe au lait, we went right for the good stuff, selecting an Eiffel Sour Cosmo, a tarty-sweet mixture of vodka, Grey Goose Cherry Noir, Grand Marnier, and cranberry juice (because it’s 5 o’clock somewhere!). True to Europe’s geography, Disney positioned Belgium right next to France, and wafts of waffles sweetened the air. Naturally, the food portion of our breakfast was a coaster-sized, chocolate ganache-topped waffle doused in whipped cream. To say it was good does not do it justice – my eyes fluttered as I ate. Now 11:10 a.m., my husband and I felt we should supplement our sweet for savory, and Poland’s pop-up restaurant – 1 of 29 “imagineered” for the food and wine festival – was right around the corner. We selected kielbasa and a caramelized onion-garnished pierogi from the tasting menu, with ours coming out in the shape of Mickey. Since Italy was practically right there, we noshed on our Euro fare beside a gondola floating in Epcot’s lagoon – I mean, a canal in Venice. A shrimp taco and tequila lunch in Mexico followed, as did multiple sips of watermelon juice, which served as the perfect palate cleanser between courses on our six-continent tasting menu. As the sun started setting, we found ourselves in Japan, perched on the steps of a five-story pagoda savoring a spicy sushi hand roll we DIY paired with a tumbler of Florida’s key lime wine. And here’s where the only-in-Disney plot thickens: suddenly we heard the legendary band, Starship, belting out, “Nothing’s Gonna Stop Us Now.” As children of the ’80s, we were drawn toward the music, part of a nightly Eat to the Beat concert series. Just in time for “We Built This City,” we arrived at the theater and promptly rocked out with our sushi and key lime wine. The moment was at once eclectic (and electric) and perfect. Beyond the bites and bevs, cooking demonstrations, tasting seminars, and gourmet galas await. As fans of all things Francais, we attended a Grand Marnier mixology series in France. Over flights of the orange-infused cognac we took sips down Grand Marnier’s memory lane, mixed our own grand smash cocktail, and feasted on crêpes suzette. Viewfinder Tip: Access to the 29 pop-up restaurants with menu items ranging from $2.50 – $10 is included in the price of Epcot admission. Tasting seminars, cooking demonstrations, and gala events are a la carte. 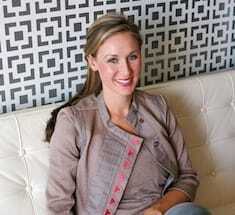 Nearly eight dozen celeb chefs also stop by for book signings, and to mingle and munch. During the opening weekend, I met Chef Carla Hall from ABC’s The Chew (and, before that, Bravo’s Top Chef). 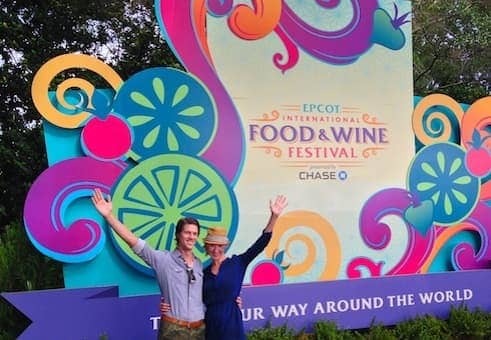 She was at Epcot to chat about her new cookbook, as well as snag one or two of the festival’s 1.5 million bites. Her two favorite dishes were the kimchi dog with spicy mustard sauce from South Korea and the crispy pork belly from Brazil. Speaking of Brazil, after sampling a few of their local sips, I’m now a major fan of their Xingu Black Beer, a not-too-carbonated brew hinting at dark chocolate. Now I’m contemplating ways to find this beer at home. Conversely, I hear Brazil is lovely this time of year. Dear food-loving travelers, the best part of Epcot’s 46-day foray into food and wine is this: satisfying your food cravings and fueling your wanderlust at the same time. What’s your favorite global fare? Do you think you could find it at Epcot?